From Early Light Media’s passion project series, Throw tells the story of an outsider from East Baltimore, an area challenged by gang violence and poverty. Often misunderstood, Coffin Nachtmahr found acceptance among a subculture of “throwers” and it turns out, he’s a virtuoso. He now helps others find a creative and social outlet by sharing the very toy that inspired him. In high school, Coffin was bullied for having a stutter. 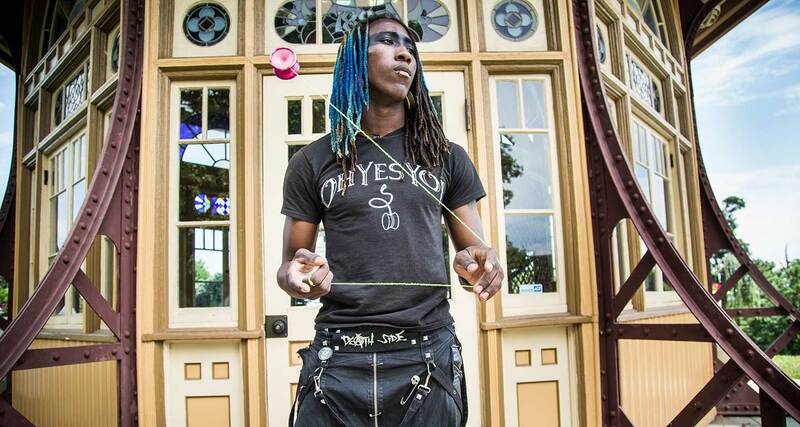 Angry, violent, and lonely, he came across a video online that introduced him to a form of yo-yo known as ‘throwing’. Practicing this art gave him comfort and confidence. Before long, he had developed a crew of fellow throwers who also found throwing culture to be a means of transforming their lives. With incredible sequences of virtuostic yo-yo performance, Darren Durlach and David Larson’s Throw is a story of a subculture whose adherents are healed by their shared creativity. This entry was posted on February 26, 2017 by Vox Populi in Art and Cinema, Health and Nutrition, Social Justice and tagged Coffin Nachtmahr, Early Light Media, occupational therapy, Throw, Yo-yo.